Home / Wijith DeChickera/ Something happened out there, but what’s going on in here right now? Something happened out there, but what’s going on in here right now? I have a confession to make. Yours truly has really lost track of what’s happening in the arena we call national politics. There was an election, you say? Well, that much I know, being a journalist (self aware nod). There was a falling out among star-crossed political bed-mates? Say, you don’t have to be an astrologer to have seen that coming – although some jilted lovers seem to have seen stars. There was a flurry of political, legislative, and constitutional high-jinks in which the fate of an entire nation (to say nothing of an arranged marriage) hinged on trivia such as what constitutes a coalition and how its component parts are composed, defined, identified? Something happened. 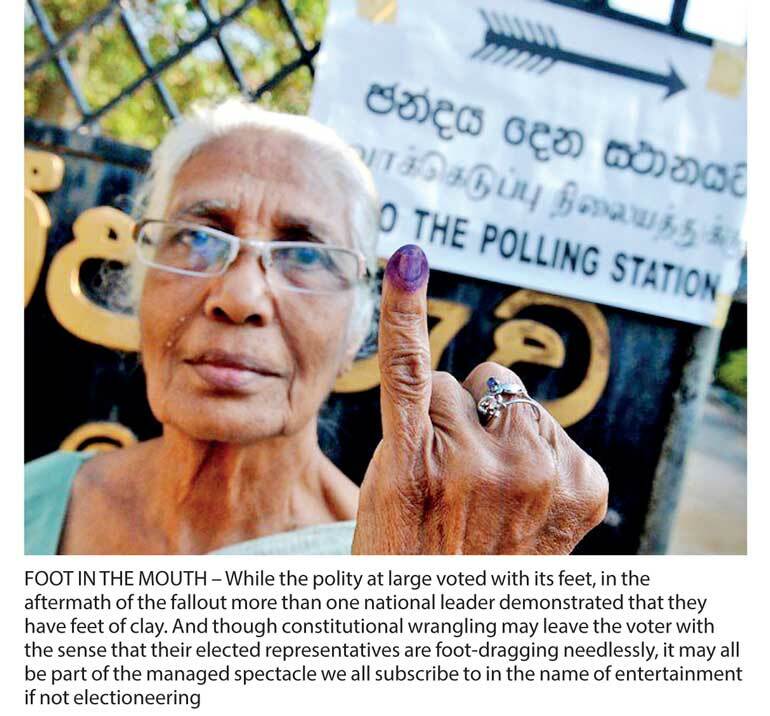 Sundry analyses since that fateful ballot – Sri Lanka’s third-largest since 1978 – have evaluated outcomes and ramifications until political assessments are de rigueur for any self-respecting armchair theorist and de trop for a fed up voter. However a bird’s-eye view behoves a believer in hindsight who’s about to burden you with his own perhaps less than insightful perspective, albeit one influenced more by Immanuel Kant than Genghis Khan. A former strongman’s proxy party was the cat-o’-nine-tails that a disenchanted polity used to crack the whip on Good Governance gone wrong. The local government poll for over three hundred wards in effect became a referendum on national level leadership over three years. Proof positive that MR is by far the most popular politician on the post-war landscape was provided for metropolitan pooh-poohers who had written him off as yesterday’s news. However corrupt and criminal his cabal may have been perceived to be, a combination of factors saw a resurgence of favour for his populist and nationalist views. The alliance is still intact. Their mandate of 2015 stands unabridged. However its constituent parties of alliance partners per se may interpret the slap in the face supplied by a disenchanted polity, there is still space to manoeuvre for the coalition of coalitions to survive as well as stymie the threat of a potential resurgence of post-conflict ethno-nationalism. Therefore all the President’s mien had to be was repentance of his own chauvinism of late, and he could make amends with his Prime Minister’s party to ward off the enemy at the gate. Here was a wobble necessitated by a long put off poll, which was readily steadied by putting temporary animosities behind in the larger national (not forgetting partisan) interest. There are as many beneficiaries of this princely hypothesis as there are main players. One usual suspect sees the former President as the brains behind a trap to let MS overreach himself as regards a desire to control the SLFP and shoot himself in the foot. Some stalwarts who seem sanguine about weathering defeats snatched from the jaws of victory attribute the Machiavellianism to the old fox’s young master tactician our ubiquitous Premier. Other less convincing theorists have the incumbent head of state playing a shrewd game of cat and mouse with both UPFA and UNP, but getting the timing of his slightly premature presidential bid a tad tight around the globules. These defenders of their respective champions are penning hagiographies perhaps, not histories? However nice one might be to one’s duly elected national leaders or no matter how nasty they turn out in the end, there is only normal or natural surprise to be expressed in response to the supposition that it’s all smoke and mirrors. In a nutshell: the LG poll was bound to be an unavoidable road-bump… so go for it at full throttle and with all courtesies suspended, manufacture a split to engage one’s electorate, test the temperature of the water, and if it’s boiling hot perhaps a. call a snap presidential poll… or b. bounce back after the dust settles. The one thing that militates against this theory is the very real anger and animosity that the principal parties concerned manifested towards one another in the aftermath of the electoral fiasco. His choler at his PM’s party being as corrupt as that of his former president’s was as clear as his usually phlegmatic countenance being constrained to beg his cohorts not to attack his president. Therefore, let me be less than lucid as usual by interrogating the usual suspects – not with the hermeneutics of suspicion as usual, but the less charitable paradigm of human nature, and one in which no is either hero or hopeless horror. Political cultures don’t change overnight, even with the keen agency of constitutional amendments or the instrumentality of sea-green incorruptible agitating for Augean stables to be cleansed. Could it be the case that underneath the veneer of venality on the one hand and the patina of sophistication on the other, all men – with due respect to the masculine trinity of main players in these polls – wear the mask? Can we willingly suspend belief for a brief moment in the interim between Cabinet being ruled on by Speaker and Coalitions being Safe and Sound once again to consider that human nature – not plans, policies, principles, programmes, prognostications or other political paraphernalia – account for the pig’s breakfast confronting a choleric polity today? A man is the measure of all things. Analyse the outcomes and ramifications of the LG poll in the light of MS, MR, and RW being men – well, rather than party machines or political movements. Full marks if you can forgive them for their cupidity, stupidity, etc. i. If you were to vote for a party machine at the next presidential poll, which party would be that machine? ii. If you were to vote for a political movement at the next parliamentary poll, which movement would you regard as being the best party political vehicle in the larger national interest? c. Whatever the Hon. Speaker says it is, honey! I am a journalist. I know nothing. And that is a good place to start. But if that is where we all end, there’s something terribly wrong with the bigger picture. In our beginning is our end. After all has been said and done by all and sundry, there is still that nagging nauseating feeling that nothing has really changed at the end of the day. Things fell apart, the centre barely held, and we’re back to square one for the moment. However much dogs may have barked and beggars thrown stones, the caravan continues to the dawn of nothingness. Therefore let us gird our loins for a beast slouches to Bethlehem to be born again. I don’t have to be an astrologer to tell you that the writing is in the stars and on the wall about who the king of kings is going to be. If there is no honour left between gentlemen thieves and patriarchal braggarts, it’ll be the charismatic schoolyard bully’s best friend who makes head cop again. Oh one last thing. The public interpretation of political motives ranges from the enlightened to the self-interested as far as the individuals we elect goes. The only thing we can count on in the end is not their political savvy or their party strategy. But the sense of sub-enlightened self-interest that characterises the good, the bad, and the ugly today. For in the end nothing much happened, nothing really changed, and truly it was ever thus that the more things change the more they remain the same for better or for worse. A senior journalist, the writer is Editor-at-large of LMD. He has little civics and less constitutional knowledge, but he does have some insights into human nature, being something of a psychologist.